In the previous article (titled ‘Why study birds?’ which appeared in Teacher Plus, August 2018), we discussed what we can learn from observing birds and how understanding these creatures in depth can lead to a richer appreciation of the natural and material world. The current article discusses a simple activity around bird watching. Through this activity, students will learn to make links between the presence of birds and bird behaviour with the environment (biotic/abiotic/natural/artificial); develop skills of observation, attention to detail, documentation – all integral to the scientific process. The activity also aims to reconnect and reestablish our fading connection with nature. Notebooks, pen, pencil, colours, binoculars and camera (optional). Field guides and student handouts*. Having a general understanding of bird anatomy (crown, wings, tail) and its function, different bird behaviours, their role in the ecosystem will be useful. Many points are covered in CBSE science textbooks of classes 6-9. Some information that the teacher needs to know can be drawn from this series. Target age groups: This activity can be carried out with students from class 6 and above. Number of sessions: This is completely dependent on the teacher and the availability of time. However, a minimum of three sessions over three weeks, with work spanning the week is recommended. This is assuming that each session is roughly 120 minutes. The activity can be extended over several weeks, months or even a year, which will give the opportunity to observe birds over different seasons. • Which is your favourite bird? Why? • Are there stories you have heard about birds? • Describe the most colourful bird you have seen. • What is the funniest thing you have seen a bird do? The teacher can ask students to write down their responses in their notebooks, which she can later refer to. Share some interesting facts about birds to generate interest and excitement about the activity. For example, there are roughly between 9,000 and 10,000 species of birds in the world, of which around 1200 can be found in India, of these a little over 60 are endemic, that is found only in India. Two case studies, in the form of stories, can be presented to the students. How vultures almost became extinct in India! India was once home to almost a million vultures, which decomposed carcasses and performed a valuable service in the ecosystem. Unfortunately, from eating cattle that had been treated with a medicine called diclofenac (a common drug administered to treat symptoms of inflammation, fevers, diseases, etc. ), more than 99 per cent of India’s vultures perished in less than 10 years. Following this decline, some studies tried to draw parallels between the increase in the number of stray dogs (which fed on decaying flesh that was now uneaten by vultures) and incidences of rabies across India. We are now trying to save our vultures by captive breeding, banning diclofenac and protecting their nesting habitats. Sparrows are common across the world and also seen alongside human habitations. But over the last couple of years, people in India started reporting the absence or fewer number of house sparrows in their area. This led to the birth of the Citizen Sparrow Project, a citizen science project spearheaded by Bombay Natural History Society together with a group of nature and conservation related organizations. They analyzed over thousands of reports from across India. Though it was evident that some regions did show dwindling sparrow populations, the reasons for it are still unclear and debated. Based on these results, several initiatives were proposed to increase or restore sparrow populations across the country. To know more visit http://www.citizensparrow.in. The teacher discusses the basics and ethics of bird watching with students. * Discussing these are absolutely essential and central to the activity. Take the students outdoors and let them decide their target species. Divide the class into pairs or groups of 3-4. Remind students that they will have to observe the bird over several weeks, so for beginners, it’s best to choose commonly sighted birds like crow, myna, sparrow, pigeon, kite, etc. Task 1: What to do? Choose a safe place in school or near your home, where you feel there is a lot of bird activity. Mark this as your “observation point”. Spend 10 minutes each morning, noon and evening, observing one species of bird from your “observation point”. Do not forget to write down the following header information: day, date, time, weather, location and for how long you carried out your observation. Draw the bird, as you see it and label it. You can colour it if you want. It is alright if your drawing is not beautiful. Focus on drawing what you see. Let us say, you are observing a house crow, and after a few minutes, it flies away. Make a note of it and then continue observing another crow. You are welcome to observe the birds for more than 10 minutes. Write what you find interesting about the bird or its behaviour. Do this every day for 1-3 weeks. Maintain a daily log. What to expect from students? 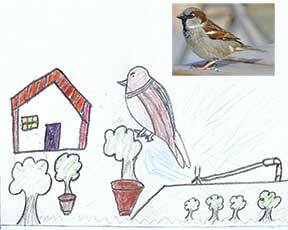 Image 1: A grade 8 student’s drawing of a house sparrow. To compare, a real photograph of a male house sparrow (Wikimedia Commons/Adamo) is presented. A simple drawing exercise like this can help the teacher direct students’ attention to specific details. For example, notice the errors of the sparrow drawing when compared to a real photograph. Though the student has got the colours correct, the location of the colours (head, neck, breast and wing) are not entirely accurate. In general, observations will include: time of the day, weather, environment conditions, what the bird is doing (foraging, preening), whether it is in a group, did it call (make sound), interactions with other birds of the same or other species, whether you can tell male and female apart, etc. Image 2: Snapshot of a grade 8 student’s field notes on a pigeon. 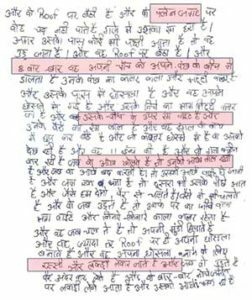 The highlighted sections show the student 1) dabbling with English whilst writing Hindi, 2) explaining the behaviour “preening” 3) observing and mentioning specific morphology with respect to the bird’s beak and eyes and 4) reporting nesting behaviour. Encourage students’ attempts to write descriptions in their own words. Target learning trajectory: Try to get your students to move from descriptions mentioned in point 1 to descriptions mentioned in point 5. Teacher groups all the “same species” together. 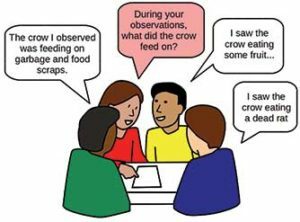 For example, all the groups who observed house crow will now sit together and discuss their observations. They will try to identify similarities and dissimilarities in their observations*. Teachers can guide them to see if any patterns emerge or if any generalizations can be made. For example: What is the diet of the bird? Or what was the bird feeding on? Similarly, groups will sit together and list other common and uncommon observations. * Students will continue to make observations the whole of next week as well. Task 2: What to do with your collected data? Try to make more precise observations. For example, is the house crow only black in colour? Or is it a combination of grey and black? Increase your observation time to get more detailed descriptions of the bird’s behaviour. Continue your (morning, noon, evening) observations for a few more weeks. Students will once again consolidate their data as they did in session 2. After collating their information, each group will work on documenting their data. Make a resource (handmade/digital) using the data you have collected over the last few weeks. Additionally, based on your data, make an interaction map which shows the bird’s interactions with its immediate surroundings. If students have observed any peculiar or interesting behaviour of a bird, they can write a short report on it, giving exact details. A flash card on their bird species*: It is essentially a card bearing words, numbers, or pictures that is usually used as a learning aid. Alternatively, they can make similar looking posters for their classroom. But the amount of information the poster can accommodate will be more than the flash card. Accordingly, plan the space and format. An interaction map of the bird: The map is essentially a snapshot of all of the bird’s interactions with its immediate surroundings. The map (Image 5) shows in brief all the interactions the pigeon has had with its immediate surroundings. Some of these components are living (marked in green colour) while some are non-living (marked in red colour). 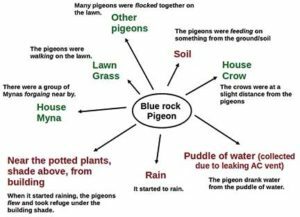 Students need not follow this template exactly; they can use their imagination to make any sort of map to visualize the data they have collected over the last few weeks. Note that this map will be enriched by longer durations of observations and not merely by observing a bird for one day. The data in the resource (poster/flash card/map) should be a reflection of what the students observed over the last 2-3 weeks or more. It should not be copied from books or the Internet. If you/students think that data is not enough to make a resource then continue the observations for a few more weeks. Students are likely to find it difficult to go about the observation task as they will not know what exactly to observe. The next article in this series will include some handouts which can guide students to observe and document more meticulously. The handouts will also carry a summary of task descriptions, brief outline of ethics of birdwatching, new terminologies and guiding questions to summarize each group’s observations. Encourage students to use those handouts. In the above text, situations that require the use of handouts are marked with a star (*). Acknowledgments: This section includes inputs from Dr. Anand Krishnan from IISER Pune. Thanks to all the students who were part of the many workshop-trials, and to teachers who reviewed the draft and gave their valuable feedback. 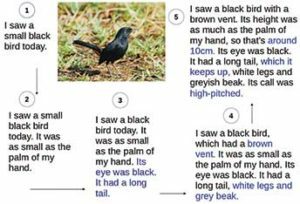 This is the second in a four-part series on a simple learning unit on observing birds, developed as part of the Vigyan Pratibha Project. The learning unit is constantly updated based on feedback received from students and teachers. For updated information on this unit, visit https://vp.hbcse.tifr.res.in/.